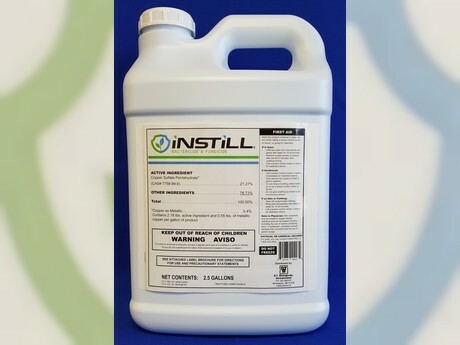 Producers in California now have access to a longer-lasting copper bactericide and fungicide – Instill protects nut trees, fruit trees, citrus, leafy vegetables and berries. Instill provides growers innovative new use options for copper. For example, pistachios need copper nutrition, and using Instill as a copper fungicide choice will help satisfy this need without adding any cost. For leafy vegetable and berry growers, Instill leaves no visible residue, making it possible to apply copper even very close to harvest. Instill’s formulation makes the copper more active, so much lower doses of copper are required to provide the same level of disease control. Added to that, when Instill moves into the plant cuticle, the copper can’t be washed off, providing up to 21 days of residual control. Instill is the only copper that provides immediate copper nutrition. Instill is true copper nutrition – it’s in a form that plants can use, so it doesn’t have to be converted in the soil or pulled into the roots over time. It won’t wash into the soil or increase detrimental copper loading. Instill’s inside-out systemic activity protects against downy mildew, bacteria blights, fire blight, powdery mildew, botrytis and rust. It helps reduce post-harvest rots and can be used up to the day of harvest. Prior to receiving California registration, Instill has already been in use in most fruit and vegetable growing regions. In the high-value greenhouse industry, Instill is marketed as Phyton.